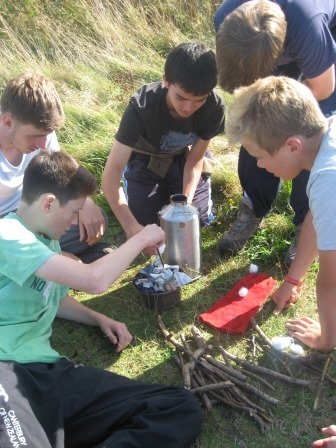 My name is Matthew Heller-Murphy, I am fourteen and I am doing green team to get my bronze duke of Edinburgh this was my fourth expedition and I now have my john muir and nearly have my DofE award. The expedition I am going to write about was in longniddry. 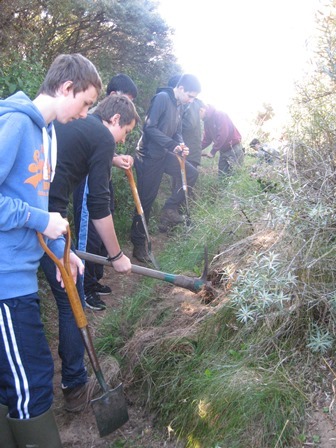 We were widening an area of the John Muir way with shovel and mattocks then cutting overhanging vegetation with loppers. It was a nice day so we were all in a strangely good mood considering we were digging a pile of dirt. After we had had lunch on the beach in the sun we started on our flower survey of a thistle of some kind and a purple flower that I couldn’t really remember the name of at the time. In the end it turned into a berry picking festival seen as there were lots of bramble patches in the unused car park/endangered flower area. After we had finished that we made storm kettles in proper green team fashion. We also had a circle time of sorts sitting on tank blocks-big blocks of stone to stop tanks getting onto land-and discussing our day. We ended in a game of Frisbee on the blocks jumping between them which was quite fun. All in all it was very nice and enjoyable and I will probably keep on doing green team after my DofE.